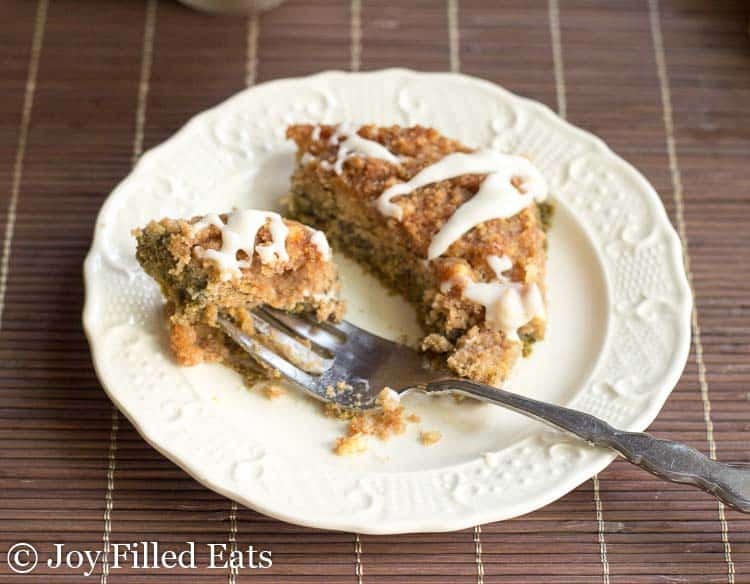 My Pumpkin Dump Cake is like a pumpkin pie & a crumb cake got married & had a baby. It is cakier than a custard but more custardy than a cake. Growing up my mother was the queen of dump cakes. She made a cherry one and a pineapple one and probably a few other varieties I can’t remember. They are super easy to make and really tasty. 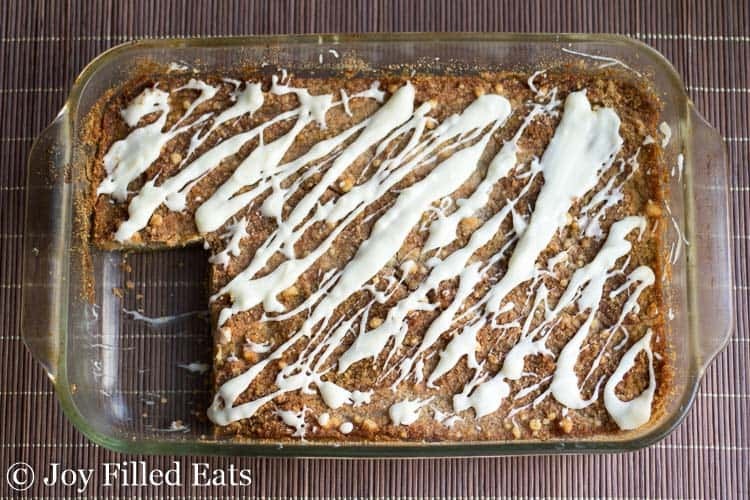 You dump some fillings in a pan, sprinkle on cake mix, drizzle with melted butter, and bake. That’s it. She loves pumpkin pie so I wouldn’t be surprised if she has made something similar to a Pumpkin Dump Cake. 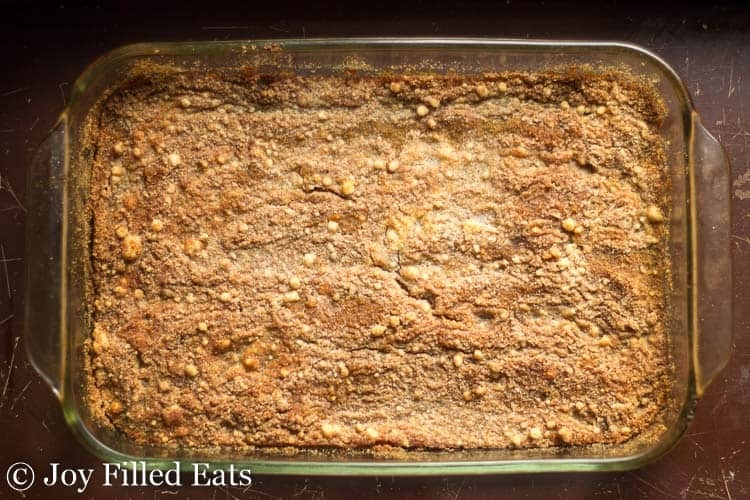 When I saw a video floating around facebook for the Pumpkin Pie Dump Cake at The Country Cook I knew I wanted to make a healthy version. No, I knew I had to make a healthy version. Because I needed to eat it. I thought that the dry ingredients I use for my Almond Crumb Cake would work nicely to replace the cake mix. So all I had to do was whip up a pumpkin custard base, sprinkle those on top, add butter, and bake. I wasn’t sure it would work. Baking with alternative flours is even more of a science than regular baking. So when the cinnamon smell filled my house I started to get excited. And then it looked like it was supposed to when I pulled it from the oven. Then, I tasted it. Yes! It worked. Keto Pumpkin Dump Cake Success! I decided to add a cream cheese drizzle because cream cheese and pumpkin go incredibly well together. I still want to make a version of the pumpkin roll my cousin Theresa makes around the holidays each year. Hoping to get that done by Halloween. This has a very unique texture. I said on my facebook and instagram that it is like a pumpkin pie and a crumb cake got married and had a baby. And that is completely true. It is cakier than a custard but more custardy than a cake. We really loved it. My 7-year-old daughter kept asking for more. I like this best cold. It is perfect for breakfast on a cool morning with a steaming mug of coffee. 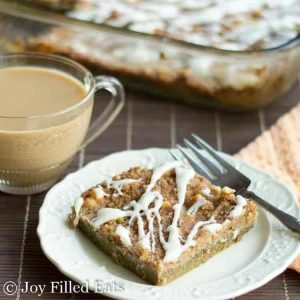 I hope you enjoy this Pumpkin Dump Cake as much as we did! My Pumpkin Dump Cake is like a pumpkin pie & a crumb cake got married & had a baby. It is more cakey than a custard but more custardy than a cake. Preheat oven to 350. Spray a 10 x 13 pan with cooking spray. In a bowl mix all the custard ingredients with an electric mixer until smooth. Dump into the 10 x 13 baking dish. 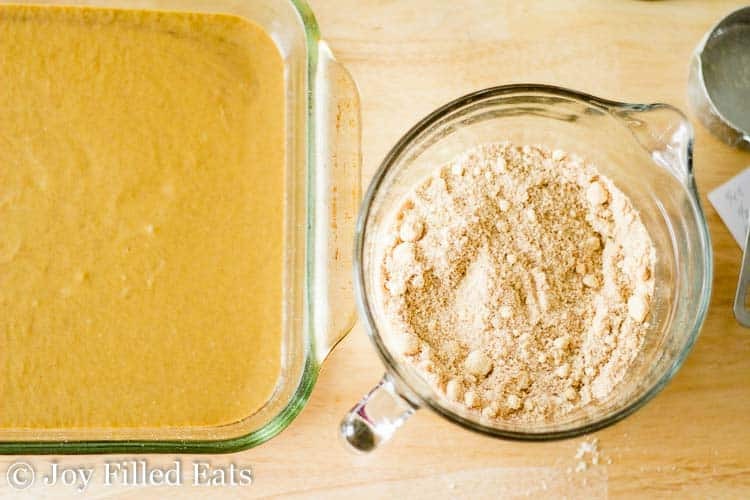 Mix the almond flour, coconut flour, 7 tbsp sweetener, and 2 tsp cinnamon until well combined. Try to break up any lumps in the almond flour. Sprinkle on top of the custard. Drizzle the melted butter over the dry ingredients. Bake for 50-60 minutes until the center is firm to the touch, the edges are golden, and your house smells heavenly. Cool completely. Make the cream cheese drizzle. Combine the cream cheese, sweetener, and 1 tbsp of the half and half until smooth. 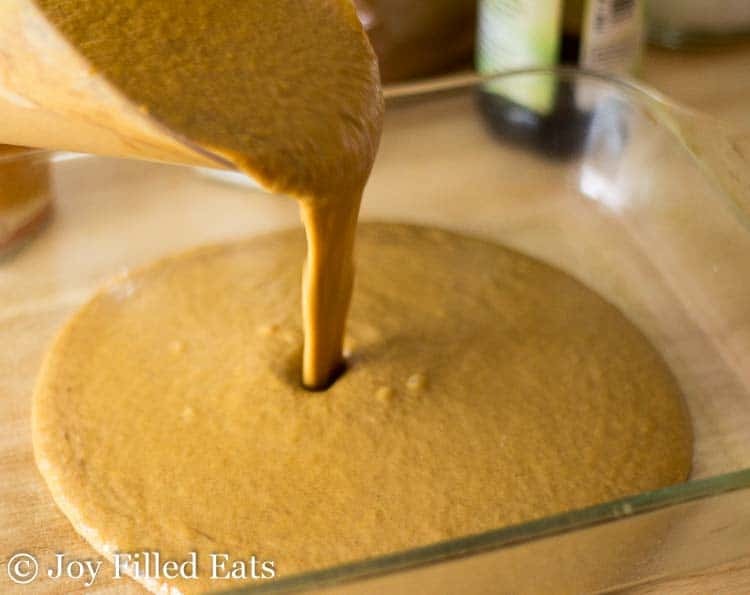 If it is too thick add a little more half and half until it is thin enough to drizzle on top of the cake. Drizzle it on top. Store in the fridge. I like this best cold. It is difficult to use all coconut flour because it behaves much differently when baking. I'd suggest using sunflower seed flour (just grind raw sunflower seeds) instead of the almond flour. How long does this keep in the fridge? It is delicious and I don't want to have to throw any away! Up to a week. You can also freeze it! If I were to just use Truvia or Stevia what would the proportion be? Truvia measures the same as my sweetener. I'm not how much stevia or if it would work in this. Loved this the first time I made it. Can it be made without halfing it in a smaller pan to make a thicker cake? I'm sure that would work but I haven't tested it for a baking time. I made this today...I added about 3 ounces of chopped walnuts and about a 1/2 teaspoon of Redmond’s Salt to the cake part to temper the sweetness. This is seriously delicious! I added this to my must have holiday desserts list. YUMMY! This is amazingly delicious! The cream cheese glaze really ties together the flavors. I also added chopped walnuts to the crumb mixture to give a bit of crunch. Hi! Did you put this cake in the refrigerator or can it stay out? It needs to be refrigerated. Thank you so much for all your hard work. You and your recipes are a wonderful blessing. I halved this recipe because no one else in my household will eat something like this. I am so sad I didn't make more! It's delicious!! This looks amazing! I’ve been looking forward to making my first pumpkin dessert of the season! My sons have egg and peanut allergies. There are so many substitutes for eggs and I hate to buy all of the ingredients for a fabulous dessert and screw it up with the egg or nut replacement. What would you suggest specifically for the 3 eggs in the custard? I'm sorry but I'm not sure how to switch out the eggs for the custard. Do you have an egg free custard you like? I could reference that and give suggestions. Could this be made in the crockpot? Any tips? Hi Eva, I'm sorry but I've never made any cake in the crock pot so I don't really have tips. If you found a different crock pot dump cake to reference cooking time and temp you could probably just sub in these ingredients. This looks so amazing! I can't wait to try your recipe. I'm always looking for new gluten-free recipes to try. I also pinned it to Pinterest too. I love easy desserts like this! Super tasty and simple to make, the perfect combo! I can't wait to try this. 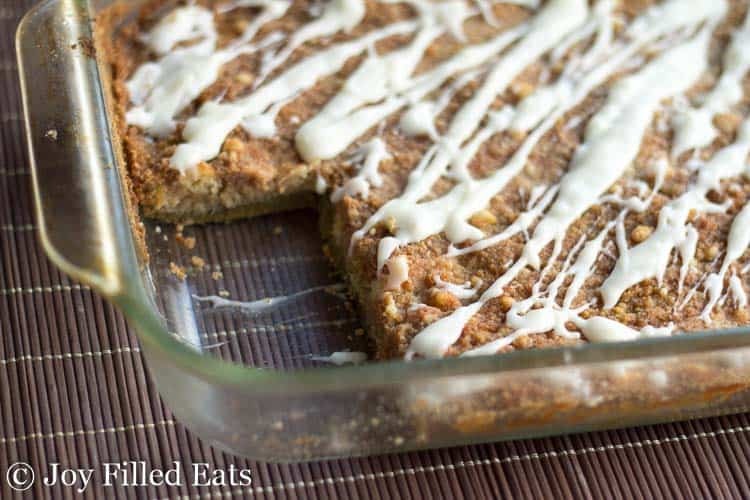 I think I'm going to add some chopped pecans to the topping..
Can you use the Trim Healthy Mama baking blend instead of the almond flour and coconut flour? Would it be the same proportions? I normally recommend using a little bit less because bb can be drier than almond and coconut flour. What is "scant 1/2 cup" mean? Slightly less than 1/2 a cup. What's 'half and half please? Half cream and half milk. It's very common in the U.S.
Could you use baking blend instead of almond flour? Yes, baking blend should work in this recipe. Can I substitute coconut milk instead of heavy cream? Yes, full fat canned coconut milk should work. This is the best fall dessert I've ever had! Amazing texture and flavor. Does not taste low carb at all. Well done, Taryn!!! Good but needs salt. Most pumpkin pie recipes have salt in both the filling and the pie crust so I will add next time to bring out all the flavors. Also mine was done in 35 min...glad I checked it early! Great recipe, will make again. I use salted butter. Not sure if you typically use unsalted? I found the melted salted butter drizzled on top to be enough salt in this recipe. What is the sweetener blend you refer to? The words in the post are clickable links. 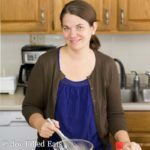 I make my own blend (www.joyfilledeats.com/sweetener) which is similar to the Trim Healthy Mama Gentle Sweet (blend of xylitol, erythritol, and stevia). I need to get rid of so much fat. could I use light milk? In place of the heavy cream? You could use half and half. I'm not sure skim milk would work. I wonder if you can eliminate the heavy cream and just up the almond milk. Can't do dairy. Do you think this would work ok? I think it would work. Coconut milk might be a better sub though because it's more comparable in fat content. Well done!!! You did an AMAZING job!! Thank you! :) and thanks for the inspiration! Hi! Let's just say that the man that wrote the famous book, " How to Win Friends and Influence People" (Dale Carnegie) never offered his friends your truffles!!! My popularity has ZOOMED!! !☺️ I've made dozens in recent weeks! Thanks for all the great recipes!!! I wanted to post a picture but somehow I couldn't. Hi Jenn, I have had some readers sub it successfully. My suggestion is to start with a little less than the recipe calls for since the oat fiber absorbs liquid more than almond flour. In pastries and lighter cakes I prefer using mostly almond flour. Now that my Costco has a 3 lb bag for $15 it is pretty economical to use it as well. This is a great recipe. Really easy to pull together and very satisfying. My son, who is sceptical about low carb treats, loved it and ate 5 pieces in one sitting! This is a definite go-to recipe. I did add a little pinch of kosher salt to each part of the recipe, which added a nice burst of saltiness along with the sweet. Well done! 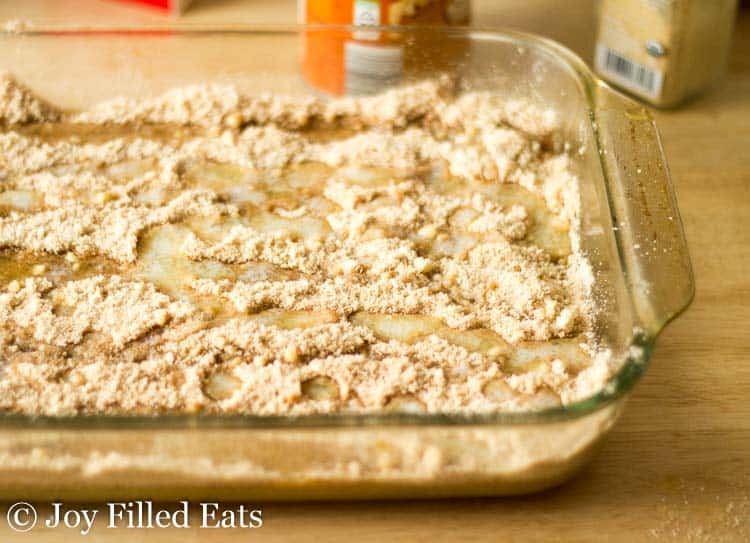 How to get to recipe of dump cake? If you are on mobile you need to click the green button for the recipe to appear. It pops up an inch or two after the page fully loads. Can I substitute baking blend? I don't use almond flour. Thanks. ? I don't use Baking Blend because I normally eat grain free but I think it would work in a 1:1 ratio. Baking blend is going to absorb more liquid than almond flour with some coconut, because of the oat fiber - you might need more liquid, or many recipes I see just use a bit less baking blend. I am ready for some serious fall flavours. Delicious! What other sweetner can you use to replace thm sweetner, i dont have that. Gentle Sweet is a blend of xylitol, erythritol and stevia that, as far as I know, is pretty much unique to THM. But half the amount or a little bit more of Truvia or Pyure should give you something like the same sweetness. I'm in the mood for pumpkin spice now! Perfect timing. A great recipe just in time for Fall!